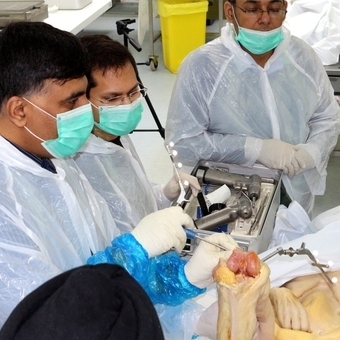 In 2013, the MCh (Orth) Dundee students had Thiel Embalming Cadavers training workshops introduced as part of their clinical curriculum introducing Total Knee and Total Hip computer aided navigation arthroplasty led by Mr Kamal Deep, Consultant Orthopaedic Surgeon and leading navigation surgeon. “this is the best training session that I have experienced in my surgical training so far” was a comment that was unanimously echoed by all our MCh (Orth) students. “We are indebted to Mr Deep, Professor Black and Dr Roos for organising such a successful experience to our MCh (Orth) students as part of their clinical course”, added Professor Abboud. “This training workshop and similar other workshops will become a regular feature in our MCh (Orth) course as we always aspire to add further surgical teaching modalities and new techniques to our excellent course”. Please note that due to our strict adherence to Thiel copyright and legal agreement we are obviously restricted as to what imagery we can show in the public domain.